Meeting, conferences, and training are an important part of an organization, and it is important to ensure the participation of office employees in order to make these events successful. You are required to track the meeting attendance in a generic meeting sign-in sheet that contains the name of the attendee, title, name of the company, phone, and fax number as well as email address. This will help you to keep the complete record of present employees, and you can easily investigate the reasons of missing employees. 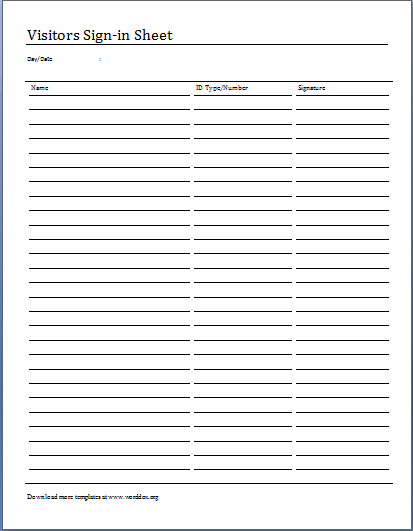 You can design a sign-in sheet in MS word, but if you do not have enough time and want some quick solution, then try this given visitors sign-in sheet sample. The template is designed to track and record the name of the persons who attended meeting or event. The template has desired format and you are just required to write the name of the organization and the title of the event at the top. Different columns are available to write name, designation, sign-in time and signature of the employees. Input all important details and get the signature of the employee in the signature column. The sheet is basically designed for virtual use in different kinds of events. The sample template is available in easy to use format, just download it, print several copies, according to gathering and input your details in it. In this way, you can not only save your time, but you can take necessary action against those employees, who missed the event without any valid reason.